If you are looking for the modern RuneScape guide for this content, please see our Garden of Tranquillity guide. Begin by speaking to Queen Ellamaria behind Varrock Castle. Firstly, speak to Queen Ellamaria near the Castle of Varrock by heading around the back to find her. 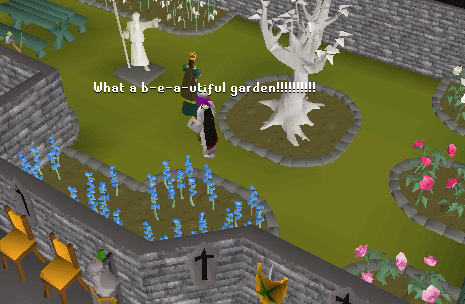 Agree to help her, and she'll tell you she wants to make the garden better, and she will give you a list of who to talk to, but first you must see the Wise Old Man in Draynor Village. Head to Draynor Village (use a Glory Amulet or walk) and talk to the Wise Old Man. He will tell you to get a Ring Of Charos. You should have gotten one after completing the Creature of Fenkenstrain quest, but if you lost it you can pickpocket Fenkenstrain to get another. The old man will check that you are a good Diplomat by asking you 7 questions. Please Note: although the questions and answers are always the same, the order in which the answers are displayed are random. So, sometimes "A" will be "B." Once you've answered his questions, he will turn your Ring of Charos into a Ring Of Charos (a). 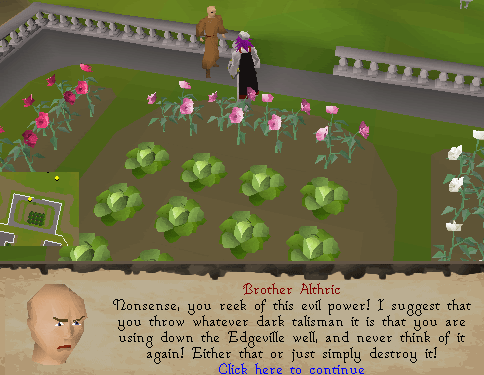 After that, walk or teleport to Falador, and talk to Elstan who is at the farm south of the city, and ask him for some Delphinium Seeds. Use the charm of the ring to persuade him into giving you the seeds. Even though its tempting, do not click the "Somebody kill me now" option. He will ask you to grow some Marigolds (agree to do this, as the charm won't work any further). Once you have the Marigolds, talk to him again and he'll give you 4 Delphinium Seeds. Now head to Port Phasmatys using either the Ectophial or walking. At the farm west of the port, talk to Lyra using the charm of the ring, and she will agree to give you the Orchid Seeds if you plant some Onions in one of the patches. Grow the Onions until they are fully grown (see the Farming guide), and she will give you some Orchid Seeds. To continue, teleport or walk to Ardougne and head northeast to the farm, and talk to Kragen. Use your charm on him again, and he'll tell you to grow some Cabbages, and once they're grown, talk to Kragen. He will give you some Snowdrop Seeds. Talk to Bernald in the garden of the pub in Burthorpe and charm him with the ring. Then use a Plant Cure on the vine. It will say that nothing happens. Talk to Bernald again and he'll recommend you talk to Alain. 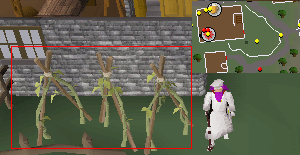 Near the gate that separates Taverley and Falador, there is a Farming Patch. Talk to Alain (don't use the charm on him), and he'll tell you how to make a stronger Plant Cure potion. Now use a chisel with the Rune Essence, then a Pestle and Mortar with the remains, and use the ground rune with a Plant Cure. You will now have a stronger Plant Cure! Head back to the vines in Burthorpe and use the cure on them, and then talk to Bernald. Congratulations, you now have the Vine Seeds! Try to take the seeds out of one of the roses from the Monastary, and a monk will stop you. He will tell you to destroy the dark object. Instead of destroying it, head over to Edgeville and throw it down the Well. Now try again and he'll tell you that you may take the seeds. Take seeds out of each of the colored Rosebushes to get some Pink, Red and White seeds. Now head back to Edgeville and use a Fishing rod on the well to get your ring back. Then go to the farm in Catherby and speak to Dantaera, and use the ring's charm on her. She will tell you that there is one last white tree on the Ice Mountain. Either teleport to Falador or walk, and then head off to the Ice Mountain. 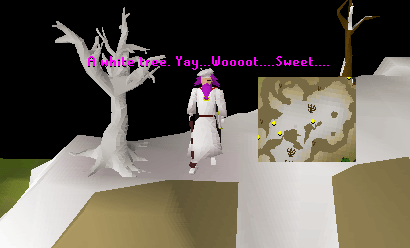 Near Oracle from the Dragon Slayer quest, there will be a white tree. Use your Secateurs with the tree to get a White Tree Shoot. 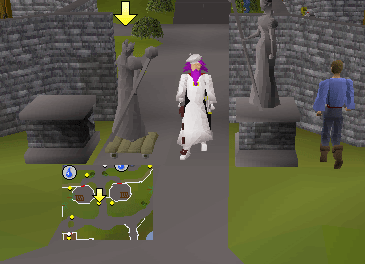 Teleport or walk to Varrock and ask the Queen how to move the Statues. She will give you a Trolley. Now head to Falador and use the Trolley with the Statue of Saradomin in the center of the town. You will see an odd cutscene about the guards discussing what they are going to do on the weekend, and then a player comes along and kills them. 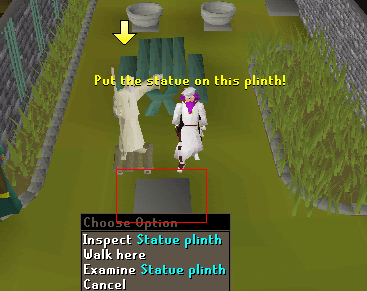 Next, you must move the statue to the Falador guards, then you will end up near the Queen. Push the statue to the most southern Statue Base and put it down. 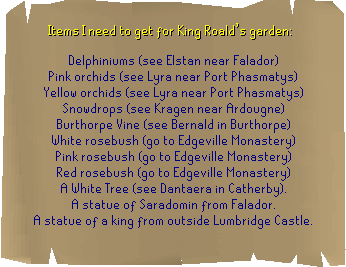 Do exactly the same as above, except with the King's Statue in Lumbridge, and push it over the bridge. Bank any unneeded items (such as teleport runes, empty vials, etc.) and head to the Queen. Use a bucket of Compost with each of the plantpots (with exception to the one you're going to be putting the White Tree in), and plant all the seeds in their respective patches (rake them first). The patches do not require any compost or watering. Use the White Tree Shoot with the plantpot in your inventory and be sure to water it. Please note that the White Tree takes awhile to grow. Once they are all fully grown, talk to the Queen, and she'll check the plants.